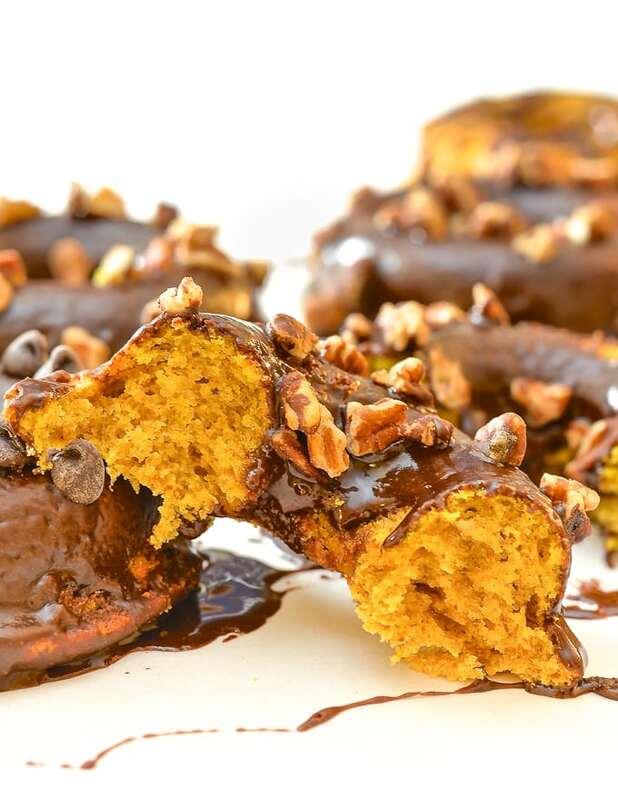 Completely, irresistibly delicious Chocolate Pumpkin Donuts. Baked to perfection, dipped in sweet & sticky chocolate frosting then sprinkled with nuts or chocolate chips! Gluten-free option included. Am I too late for a pumpkin recipe? 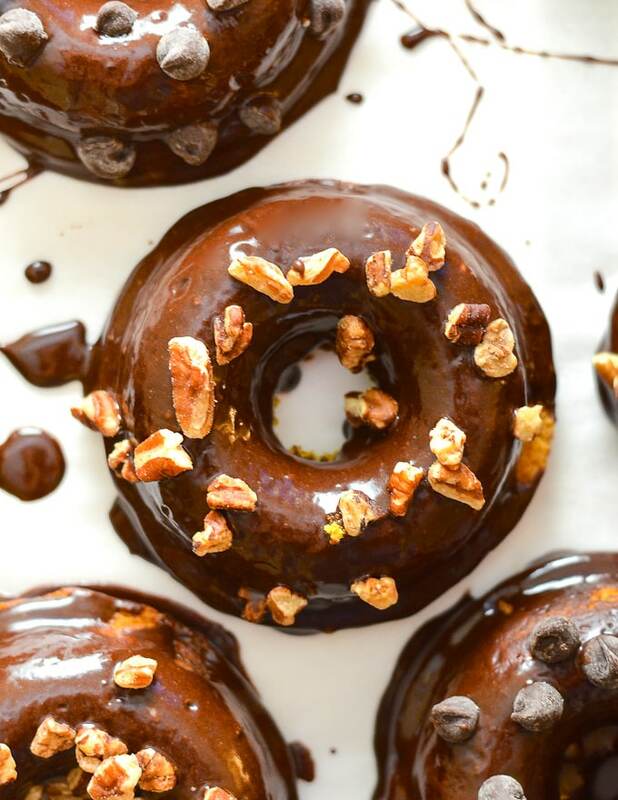 I hope not because these Chocolate Pumpkin Donuts are far too good to miss. I am a baked donut lover but it’s been a while. I know not everyone has a donut pan so I try to limit my donut recipes. Don’t stop here if you don’t own a donut pan though, because you can easily make these as muffins instead. Baked donuts, which are basically just muffins with holes in the middle, taste better though. Fact. It must be a psychological, donut obsessed, brain thing. 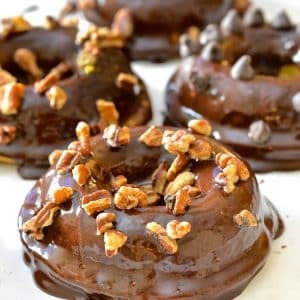 These Chocolate Pumpkin Donuts are seriously the best thing you can whip up, start to finish, in under 30 minutes. They are so quick to make and bake, and is there anything better than a soft, warm, pumpkin spiced donut with smooth, chocolatey frosting? Not at this minute my friends. I could seriously eat the whole batch. 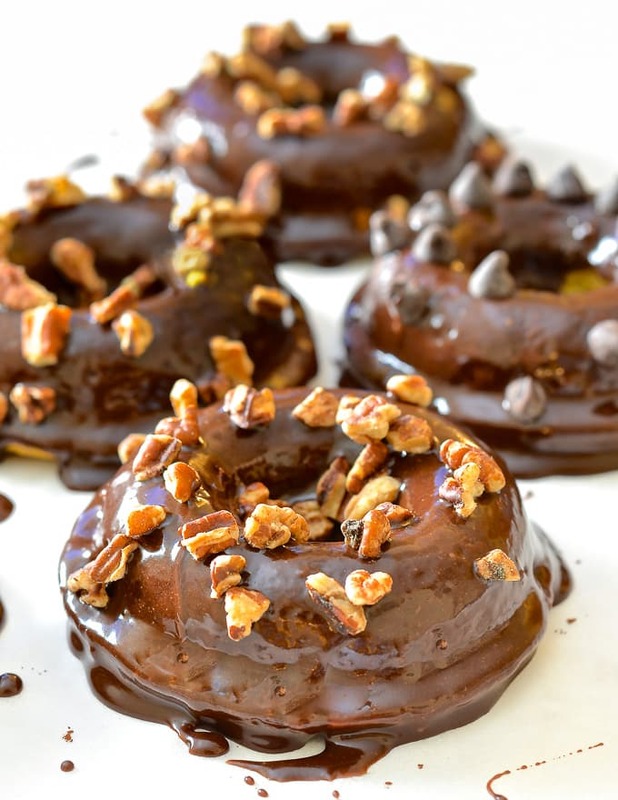 These Chocolate Pumpkin Donuts are a healthier alternative to traditional fried donuts as they are baked not fried. The sponge is light, fluffy and infused with pumpkin and pumpkin spice. It’s colour is a beautiful autumnal orange which looks so pretty against the dark brown and chocolatey exterior. Once baked to perfection, they are dipped head first into rich, fudgy, chocolatey frosting then topped with whatever toppings you fancy. I used pecans and chocolate chips. I actually surprised myself with this recipe. I tested them with wholewheat flour first and that was great, then I tried them with Bob’s Red Mill All Purpose Gluten-free Flour and I actually preferred the flavour of the donuts when made with the Bob’s flour, so if you have some in your pantry, I highly recommend you use it. These donuts would be just perfect for a lazy brunch at the weekend, or make them in advance to enjoy throughout the week. WHAT IS THE BEST DONUT PAN FOR BAKING? For those of you who don’t own one, you should treat yourself to a donut pan because everything tastes better when it’s donut shaped. FACT! The donuts cook evenly, they don’t brown too much and stay nice and soft. Most importantly though, they never stick. I do always grease it a little just in case, but the donuts slip out so easily. With other pans, I’ve had that awful battle while trying to get them out, which is just awful, especially when they end up ruined. SO although this pan costs a little more (it’s still less than $20), it’s so worth it to get perfect little donuts every time. If you don’t have a donut pan right now and want to make this recipe I have included instructions for making them as muffins. Waiting for you to bake them! I have the one shown in the picture above. 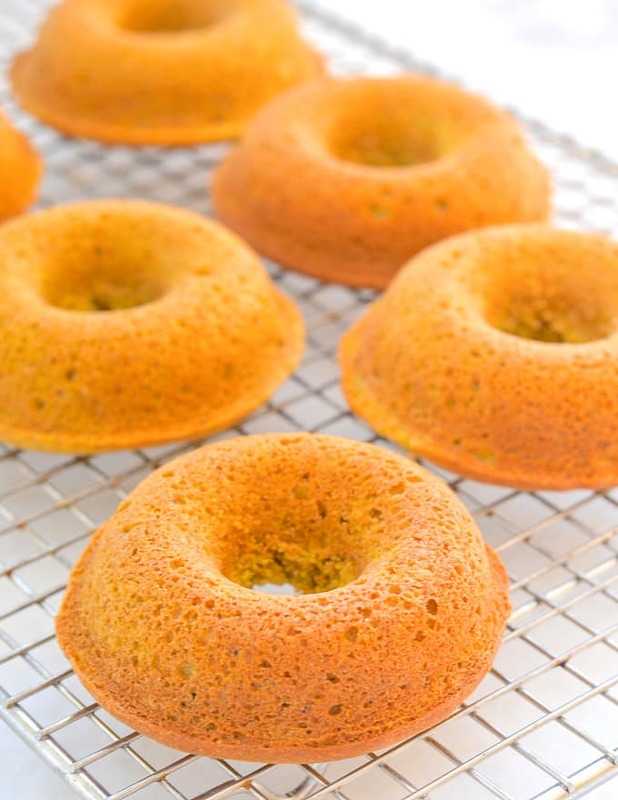 CAN I FREEZE PUMPKIN DONUTS? These donuts freeze really well as long as you don’t frost them first. Cook them and allow them to cool down completely before placing them in the freezer in a sealed container or freezer bag. They defrost in less than one hour and can then be frosted. The book will be released on May 28th 2019 and will be available everywhere that sells books. 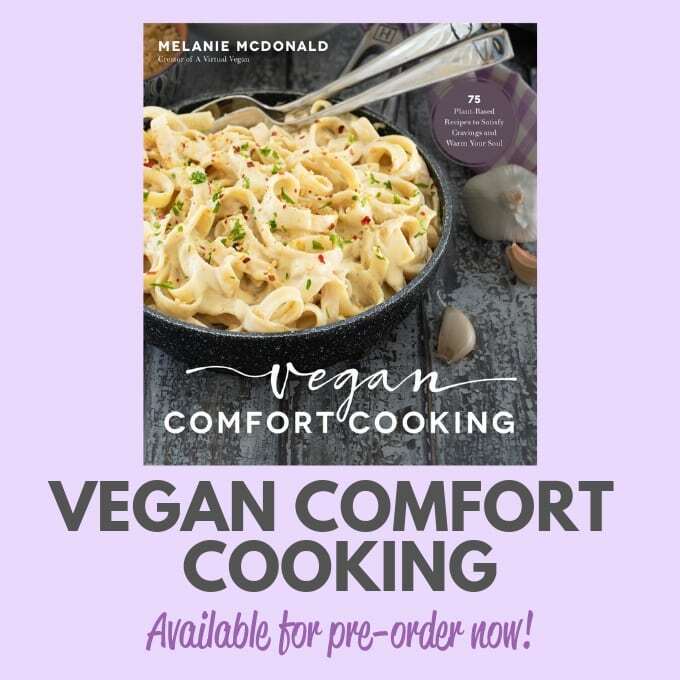 Checkout my cookbook page for more information and for pre-order links to a variety of stores. In a small bowl or cup mix the ground flax and hot water. Set aside. Put the flour, sugar, salt, baking powder, baking soda and pumpkin spice into a bowl and stir well to combine. Put the coconut oil, apple cider vinegar, aquafaba, vanilla extract, pumpkin puree and milk into another bowl along with the flax mixture and whisk them together really well. Add the wet ingredients to the dry ingredients and stir until you can no longer see any dry flour and everything is well combined. Do not over mix. Spoon carefully into the donut pan. Fill to the top with batter and use the back of a teaspon to smooth it around evenly. Bake for 15 - 17 minutes or until a tooth pick inserted comes out clean. I found the gluten-free ones cooked a little more quickly than the wholewheat ones. Turn them out onto a cooling rack and allow to cool completely before frosting. Make the frosting by combining the cocoa with the powdered sugar. Then add the milk very gradually, starting with 1 tablespoon then with a teaspoon at a time until you get a good, thick dropping consistency for dipping the donuts. Not too thick and not too thin. It will hardly take any milk to get it that way. Dip each donut into the frosting then transfer back to the cooling rack, sprinkle with desired toppings like nuts or chocolate chips while the frosting i still wet, then allow to set a little before enjoying. If you don't have a donut pan you can bake them as muffins instead. They will take 20 - 25 minutes to cook as muffins. Test them with a tooth pick or skewer. If it comes out clean they are ready. Fantastic! I do not have a donut pan, so made mini-muffins. They were so delicious, I immediately made three more batches! Is there anything I could use to replace the oil? These look delicious!!!! I haven’t tested them oil-free but I have other oil-free donuts on my site including some pumpkin ones. 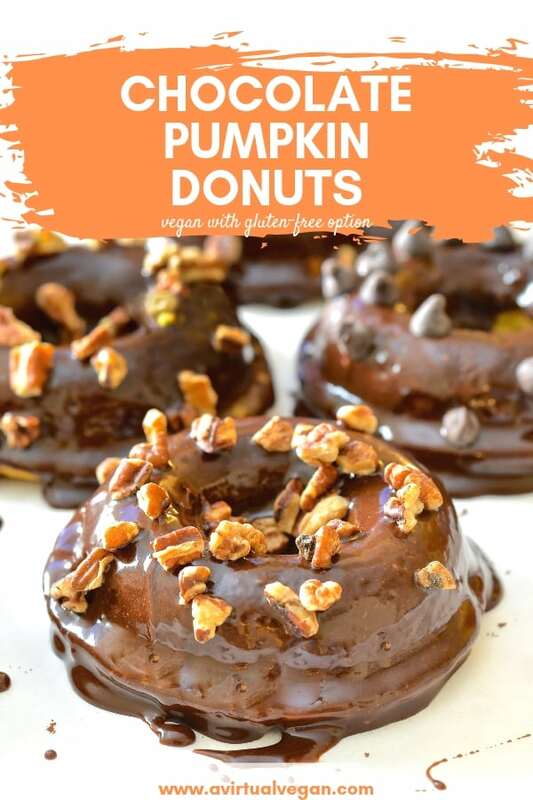 https://avirtualvegan.com/pumpkin-orange-donuts/ If you want the chocolate coating just use that instead of the sugar in that recipe! I liked your Donut recipe. So very delicious. Sounds delicious! Can I try using maple syrup instead of the powdered sugar for the icing. I don’t use that type of sugar. Thank you. It won’t work with maple syrup. The powdered sugar is what thickens and sets it and creates the frosting. You could just use melted chocolate instead if you prefer. I’ve never made donuts before, but these are calling my name! I could eat the entire batch of these delicious doughnuts. YUM! I haven’t had a donut in years! Thanks for making a gluten-free version! You’re welcome. More gluten-free recipes are to come!